TODAY IN HISTORY – 28th AUGUST 2008 ???? The nations biggest enemy dusht police tout of sumedh saini nihang ajit poohla was burnt alive in central jail amritsar. He was about to have his breakfast whilst reading the daily newspapers and was excited as he was going to be released today. Bhai navtej singh guggu and harchand singh on the other hand were getting ready to burn him. They poured petrol/diesel into a jug and when asked by the guards where are you two going? They told the guards “we are going to serve baba ji a cup of tea” the guard said. “Ill have a cup aswell” he was told to get a cup and they would pour him tea. With maharajs kirpa he couldnt find a cup and in the meantime the singhs quickly went forward into poohlas cell doused the jug of petrol over him and set him alight. He was kicking and screaming and ran towards the water. Navtej singh grabbed him and threw him on the floor allowing him to burn and in the process he partially burnt his own arm. Listen to our kavishari vaar narrating the exact events that happened at amritsar jail on the morning of 28th august 2008. On august 28th 2008 inside amritsar jail bhai navtej singh and bhai harchand singh doused paapi dusht poohla nihang with petrol and set him alight. 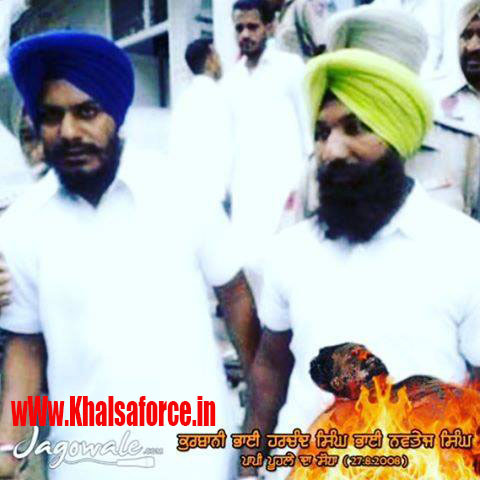 this occured on the same day and month when poohla and his gunde burned alive 5 family members of bhai balwinder singh jatana back in 1991. Poohla suffered very badly due to this incident and died the following day on august 29th. Listen to our kavishari vaar narrating the series of events that happened on this very day. these events which have been written in the form of a kavishari vaar by us are not fictional or for the purpose of making the sangat happy. these are 100% true as told to us by bhai navtej singhs father on his UK visit a few years back.